As so many new families moving into Severna Park have young kids, I’m often asked what pools are available for joining. While there are many options, most have restrictions on membership that can make it difficult to figure out what pools you can join, and how long you’ll have to wait to get in. Below is a listing of pools in Severna Park and info, to the best of my knowledge, on who can join and about how long it will take. Please let me know if you see anything missing/incorrect! Saint Andrew’s – Swim & Tennis Club – Highly desirable pool located in Chartwell with a 3-4+ year waiting list, although immediate access is available to residents of Chartwell. Very popular with the neighborhoods attending Benfield Elementary School. 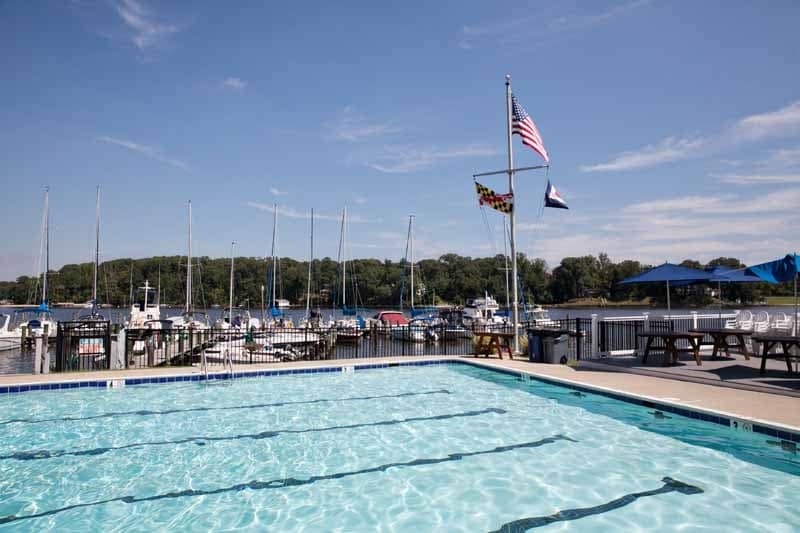 Severn River Swim Club – Another extremely desirable pool with a 4+ year waiting list, located in West Severna Park, but with no preference given to neighborhood residents. Easy walk from West Severna Park, Olde Severna Park and Severna Gardens but draws from a much wider base. Evergreen Estate Community Pool – Located in Evergreen Estates this pool now has a waiting list, although it sounds like it may be 1 year or less. Residents of Evergreen Estates get immediate access. Easy walk from Severna Forest and Harlequin, and tends to be popular with those on the waiting list for the nearby Severn River Swim Club. North Severna Park Pool – Small community pool located in North Severna Park with no waiting list. Easy walk from the neighborhoods along Robinson Rd between the high school and Rt 2. Berrywood Swim & Tennis Club – Open to residents of Berrywood, but each resident who holds a bond can also sponsor a family from outside the neighborhood, so there is an opportunity for non-residents to join. Non-resident waiting list approximately one year long. Walking distance from the neighborhoods along Lower Magothy Road. Oakleigh Forest Pool – Open to residents of Oakleigh Forest, but also allows “sponsored” non-residents to join. Member families can sponsor more than one non-resident family, so easier to get sponsored here than in Berrywood. Not currently a wait to join. Walking distance from Westridge and Arundel Plaza. North Cape Arthur Swim Club – Open to all residents of Severna Park, but currently with a wait list until next summer. Easy walk from most of Cape Arthur. Shipley’s Choice Swim & Tennis Club – Open to residents of Shipley’s Choice, but with a 3+ year waiting list unless you purchase a house with a pool bond. Pool bonds must have been issued prior to March 1995 to be transferrable, and then only once, so the number of transferrable bonds is getting smaller every year. Fairwinds on the Severn – Small pool alongside the Severn River for use by residents of Fairwinds. Chartridge Pool – Available only to homeowners in Chartridge. Fair Oaks – The final of the 4 pools located off of Arundel Beach Rd, open to residents of Fair Oaks. Glen Oban – Neighborhood pool for the residents of Glen Oban. Ben Oaks – Freshwater pond of the use of neighborhood residents. Chartwell Golf & Country Club – All membership levels grant access to the pool. Located in the middle of Chartwell. Severna Park Racquetball & Fitness Club – Saltwater pool ideal for lap swimming available to gym members. Off Veterans Hwy near the intersection with Benfield Rd. Severna Park Community Center – Pay per visit during open swim times. B&A Blvd & Cypress Creek Rd. Kids First Swim School – Lessons and some open swim times. Near the Food Lion at Rt 2 and Robinson Rd. Y in Pasadena – Great zero entry pool plus several other pools and allows swim diapers. Bit of a drive, but often the best option for those with young swimmers. Y in Arnold – Pool available to members. In Arnold, but just south of Severna Park on Rt 2. PrevPreviousThe House You Want to Purchase is on a Septic System – Okay. Wait…What! ?